A few weeks ago, one of my few readers, asked if I had a good recipe for BBQ pork sandwiches as well as a rhubarb crisp. Sometime last year I posted one of my favorite recipes for a pork sandwich, but it is apple roasted instead of BBQ. It is here if you would like to check it out Pork Chops and Apple Sauce . Anywho...here is a great recipe for BBQ sandwiches, the rhubarb crisp will come next week. I hope you enjoy. I asked my husband...."do you want the good bun or the other one." He responded.."they both look good to me." Preheat oven to 350 degrees. Any pork will do, I try and use pork that doesn't have as much fat...makes it easier in the end when you break it up, so that you don't have to cut all the fat off. Place the pork in a heavy pan and add sliced onions and peppers. I like to season with dried garlic as well. Fresh garlic will do as well. bake uncovered for 40 minutes. Then cover with aluminum foil and reduce oven heat to 250 degrees. Cook for an hour and a half. Remove from oven and let cool for twenty minutes until meat is cool enough to handle. You can shred the pork, or I like to chop it up. Next, I add all of the remaining ingredients. I just add it all to the meat and mix it well, but if you want to, you can mix it in a bowl first and then pour it over the meat. Cover the meat again and return to the oven at 350 degrees again for 30 minutes. You can cook the meat, onion and peppers in a crock pot during the day if you want and then add the remaining ingredients at the end ( I would suggest combining the ingredients in a saucepan and bringing it to a bubble first...you just want to be sure to cook the sugar.) I like this method best because the meat gets browned and that adds a lot of flavor, but I understand the need for crock potting food by others. If you don't have home-made chili sauce, I like this brand, It is called "Homade", and it's pretty good in a pinch :) So, once it's cooked, scoop it up and put it on the bun of your choice. 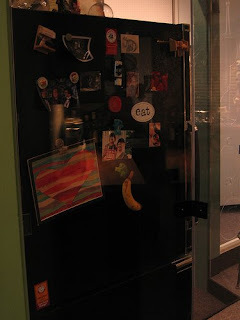 This is actually a picture of Julia Child's refrigerator which now stands in the Smithsonian. Many years back, Oprah had a show where Julia Child opened up her fridge to the world. One might have expected a stock full fridge full of amazing items. But no, the fridge was quite bare, there was a baguette, eggs, peanut butter, water and beer. It happens to all of us. When we open up the fridge and realize that there really is nothing to prepare for dinner. I have to say, that some of my finer moments have risen from this quandary. I love the challenge. I love to see if I can not only prepare a meal, but one my family will eat. I love the show "Chopped" on the Food Network. The show features four chefs who prepare a starter, entree, and dessert. But the catch is that they have to use the items provided in a little black basket. Usually the majority of the items have some taste relation, but there is always a wild card item...one item that just doesn't go with the rest. After each of the three categories one chef is "chopped". So, I found myself in a similar situation, because truly, I didn't have much more in my kitchen than the following items. 2 pounds frozen halibut, potato flakes*, milk, leftover Alfredo sauce (recipe below), blueberry yogurt, key limes, Dijon, coconut milk, plum jam, broccoli, and pasta. *Potato flakes-yes I had potato flakes...I know, very unlike me. One of my dear friends told me that there was this certain brand that she swore by and gave me some to try. they were awful just as I expected...I thought I would never find a purpose for poatato flakes (except as fake snow) until this recipe. Melt the butter in a medium saucepan over medium-high heat. Add shallots and saute until tender. Add heavy cream and bring to a boil. Cook until sauce has reduced slightly, about 5 minutes. Remove from the heat. So I took the halibut and cut it into strips and soaked it in milk, seasoned it with salt and pepper, then rolled it in the potato flakes. Next I grilled them on the stove top on a griddle I lightly coated with vegetable oil. I then mixed yogurt, coconut milk, Dijon, curry powder, turmeric, and a few squeezes of key lime together. Don't do this...It tasted awful! so back to the drawing board. I had a bottle of homemade plum jam so I put it in the saucepan with a bit of Dijon and a splash of vinegar and cooked it for a few minutes. In the meantime, I cooked up the pasta (al dente) and added a few handfuls of steamed broccoli. I mixed in the Alfredo sauce and called it good. I finished off the fish with a sqeeze of key lime juice and topped it with the plum sauce. So, this is what it looked like. It tasted pretty good, the plum sauce was a fantastic sauce for the typically bland halibut. And the family did enjoy it. But don't worry I did go to the store the next day, so I have plenty of great recipes to come.